Torrential rain has triggered hundreds of landslides, like here in the Bosnian village of Topcic Polje. BRCKO, Bosnia-Herzegovina (AP) — Floodwaters triggered more than 3,000 landslides across the Balkans on Sunday, laying waste to entire towns and villages and disturbing land mines leftover from the region’s 1990s war, along with warning signs that marked the unexploded weapons. The Balkans’ worst flooding since record keeping began forced tens of thousands of people from their homes and threatened to inundate Serbia’s main power plant, which supplies electricity to a third of the country and most of the capital, Belgrade. Authorities organized a helicopter airlift to get families to safety before the water swallowed up their homes. Many were plucked from rooftops. Floodwaters receded Sunday in some locations, laying bare the full scale of the damage. Elsewhere, emergency management officials warned that the water would keep rising into Sunday night. “The situation is catastrophic,” said Bosnia’s refugee minister, Adil Osmanovic. Three months’ worth of rain fell on the region in three days, producing the worst floods since rainfall measurements began 120 years ago. At least two dozen people have died, with more casualties expected. 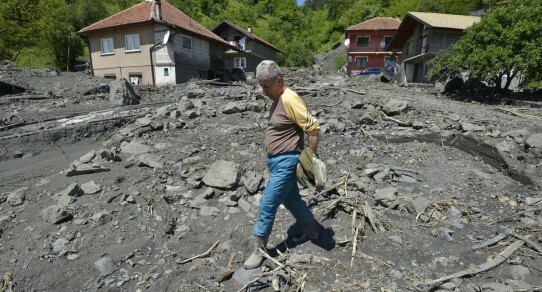 The rain caused an estimated 2,100 landslides that covered roads, homes and whole villages throughout hilly Bosnia. Another 1,000 landslides were reported in Serbia. Brcko Mayor Anto Domic said that unless the Bosnian Army is able to reinforce from the air, the city will be flooded completely. He called for the Defense Ministry to use helicopters to lower steel barriers that could be backed by sandbags to contain the water. “It is a very demanding task,” he said, acknowledging that officials would have no other way to protect the port city of more than 70,000. Civil protection commander Fahrudin Solak said the Sava River was spilling over another portion of the flood barrier in Orasje while emergency workers tried desperately to reinforce it with sandbags. In Serbia, where floods have inundated towns and villages, authorities braced for high water that could last for several more days. Serbian Prime Minister Aleksandar Vucic said Sunday that 12 bodies have been found so far in Obrenovac, site of the coal-fired Nikola Tesla power plant, Serbia’s biggest. Parts of the plant and a nearby mine that provides its fuel were underwater. Large parts of eastern Croatia were underwater too, with several villages cut off and hundreds still fleeing the flooded zone in boats and trucks. Refugees were being housed in sports halls and schools, and aid centers were set up to distribute medicine, food, blankets and clothing. In Serbia, more than 20,000 people have been forced from their homes. The alliance led by the BJP, and possibly the party alone, was headed for a majority in parliament, giving Modi the most decisive mandate for any leader since the 1984 assassination of prime minister Indira Gandhi propelled her son to office. The BJP-led alliance was winning in 332 seats of the 543-seat parliament, counting trends showed. 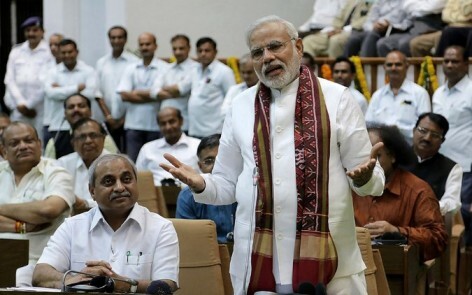 The BJP alone looked set for an absolute majority, with 278 seats. 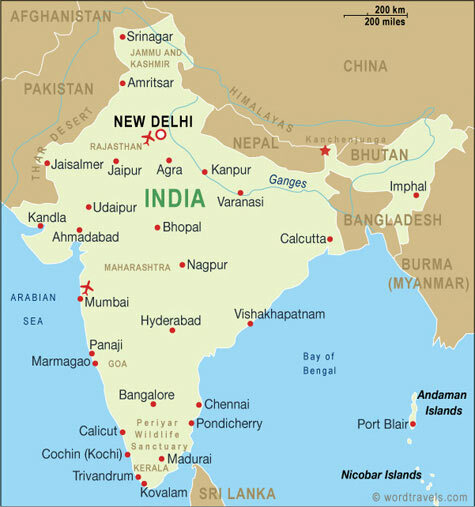 …With India’s economy suffering its worst slowdown since the 1980s and battling high inflation, it will not be an easy task to meet the hopes of millions of Indians who have bought into the idea that Modi will quickly push their country onto the top table of global economic powers. The 63-year-old’s promises of job creation and clean, efficient government resonated with many of the half a billion people who braved blistering summer heat to vote in the world’s biggest election over the last five weeks. Since being named as his party’s candidate last September, Modi has flown 300,000 km and addressed 457 rallies in a slick, presidential-style campaign that has broken the mould of Indian politics. Modi’s media-savvy, modern campaign ran circles round his slow-footed rival, Rahul Gandhi, 43, from the Congress party. The Congress Party, which led India to independence from Britain, was headed for its worst-ever result after two terms in office marred by corruption and a floundering economy. … Gandhi was leading by a slender margin in his seat of Amethi, a family bastion that has been held in turn by his uncle, father and mother, Sonia. A loss there would spell disaster for the great grandson of India’s independence leader. Modi has promised that, if elected, he would take decisive action to unblock stalled investments in power, road and rail projects to revive economic growth. Prince Harry and other British veterans gathered at the Benedictine monastery on top of Monte Cassino, which was pulverized by bombing during the Second World War. It was one of the toughest, bloodiest campaigns of the war. The knee-deep mud, freezing conditions, savage close-quarters fighting and trench warfare invited comparisons with the First World War. Tens of thousands of Allied soldiers fought doggedly for five months to take Monte Cassino, a mountain topped by an ancient Benedictine monastery 80 miles away from Rome. 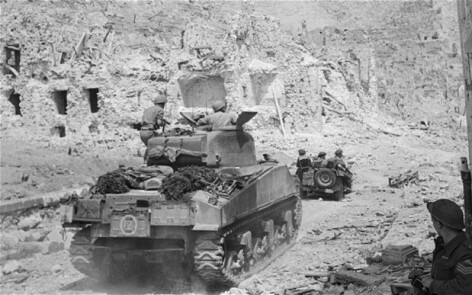 It was the last major obstacle in the push for Rome, after the landings at Salerno and Anzio. “It was diabolical. We lived like rats,” Emlyn Jones, a 94-year-old British veteran, told The Sunday Telegraph in an interview near Monte Cassino. On Saturday, he and other British veterans gathered at the monastery (which was so pulverized by bombing that it had to be rebuilt after the war) to commemorate the 70th anniversary of the battle. They were joined by Prince Harry, who visited the abbey founded in the sixth century by St. Benedict, and surveyed the steep, boulder-strewn slopes of the mountain on which so many Allied soldiers lost their lives. The soldiers were drawn from many nations. Fighting alongside British troops from regiments such as the Green Howards, the Grenadier Guards and the Royal Inniskilling Fusiliers were French colonial troops from Algeria and Morocco, Sikhs from imperial Indian battalions, Maoris from New Zealand and Polish infantrymen. On Saturday, the Prince also visited cemeteries and memorials dedicated to the New Zealand and Polish soldiers who died in the battle, laying wreaths on behalf of the Queen. After attending a cultural event in Rome on Saturday, he returned Sunday for a service to commemorate the British dead at the Commonwealth War Cemetery. BOSNIA - The floods and landslides raised fears about the estimated 1 million land mines planted during Bosnia's 1992-95 war. Nearly 120,000 of the unexploded devices remain in more than 9,400 carefully marked minefields. But the weather toppled warning signs and, in many cases, dislodged the mines themselves. Beyond the danger to Bosnians, any loose mines could also create an international problem if floodwaters carry the explosives downstream. Experts warned that mines could travel through half of southeast Europe or get stuck in the turbines of a hydroelectric dam. From the air, the northeastern third of Bosnia resembled a huge muddy lake, with houses, roads and rail lines submerged. Officials say about a million people — more than a quarter of the country's population - live in the worst-affected areas. The hillside village of Horozovina, close to the northeastern town of Tuzla, was practically split in two by a landslide that swallowed eight houses. More than 100 other houses were under threat from the restless earth. Residents told stories of narrow escapes from injury or death. "I am homeless. I have nothing left, not even a toothpick," Mesan Ikanovic said. "I ran out of the house barefoot, carrying children in my arms." Ikanovic said 10 minutes separated him and his family from likely death. He carried his 7-year-old daughter and 4-year-old son to safety. He said he had secured a mortgage and moved in only last year. "Now I have nothing," he said. "Where will I go now? Where will we live?" Semid Ivilic's house in the lower part of the village was still standing. But looking up at the mass of earth and rubble that engulfed his neighbors' homes, he said he was worried. "Nobody is coming to help us," he said. The final person to evacuate a village near Brcko said he had lost everything he valued. "I was the last one to leave," said 72-year-old Anto Zuparic. "I left everything behind, my cattle and everything else. I do not know what to do. I am glad I won't live much longer anyway." 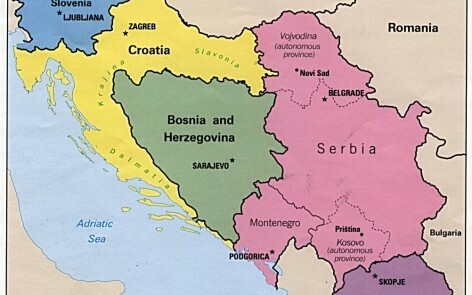 The Bosnian Army said it had 1,500 troops helping on the ground. But many bridges have been washed away, leaving communities dependent on airlifts. Helicopters from the European Union, Slovenia and Croatia were also aiding rescue efforts. GREAT BRITAIN - During the Battle for Monte Cassino, one of the harshest winters in years meant soldiers had to contend with snow, sleet and frostbite, as well as bombs and bullets. “We were out in the rain, the hail, the sleet and snow,” said Mr. Jones, from Eltham, south-east London, who fought at Monte Cassino for five months with the Queen’s Own Royal West Kent Regiment. “It’s very rocky terrain, so you couldn’t dig a trench. You had to pile up stones. There were dead bodies all around us – Americans, New Zealanders, who had been killed in previous attacks. The smell was terrible,” said the former soldier, who earned the Military Medal for heroism during an engagement north of the town of Cassino. The Germans turned the 1,700ft-high mountain into a murderously effective defensive position, with mines, booby traps and hidden machine-gun bunkers. Allied soldiers had to fight house to house and cellar to cellar in the bombed-out ruins of Cassino, in the valley beneath the monastery. The proximity of the Germans was particularly unnerving. 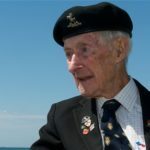 Mr Gaskill, from Can­ter­bury, Kent, who had lied about his age to join the Army at 17, said: “We heard a German [cough] one night – that was when we knew we were really close to their positions. They were hard men, mostly paratroopers – excellent soldiers.” The young infantryman survived Cassino, but was badly wounded during a later attack near Lake Trasimeno in Umbria. During an attempt to rescue a wounded British soldier after an ambush, a mortar exploded, injuring Mr. Gaskill and killing his best friend. He was found later by Canadian soldiers, with most of his uniform blown off, and spent three months recovering in a military hospital. Bill Shelton earned the ­Military Medal fighting in Tunisia before taking part in the Allied landings at Salerno in Sept 1943. 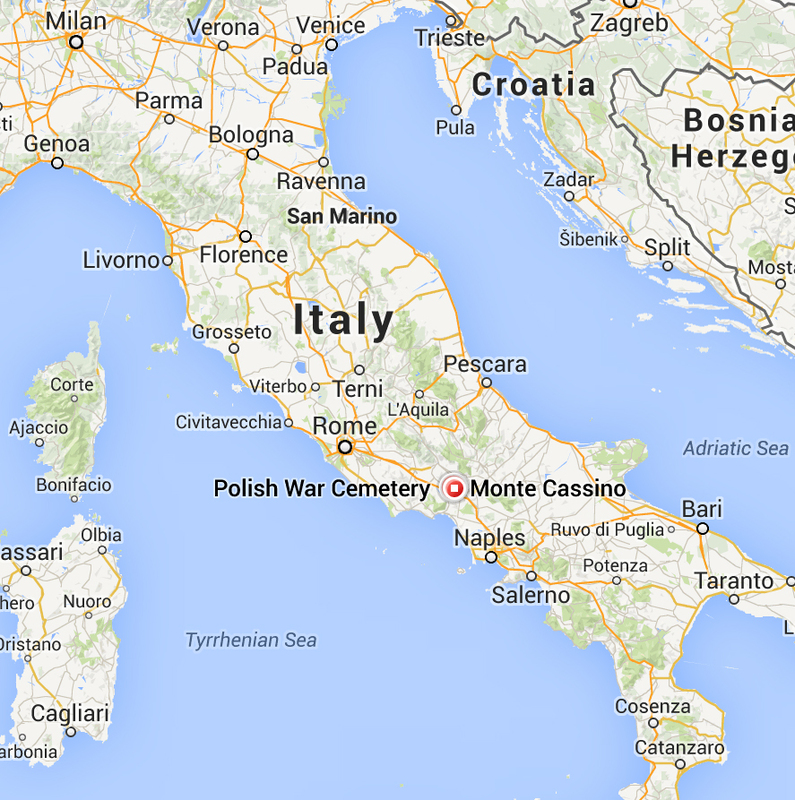 Four months later, the young gunner found himself amid the rock and snow of Monte Cassino. “Whoever insisted on doing a frontal assault couldn’t have been thinking properly – it’s a huge mountain,” said Mr. Shelton, 93, from Nottingham, who served with the Royal Artillery. For the veterans, the commemorative events will be a chance to reflect on their luck at having survived such a bloody campaign and to ­honour the memory of fallen comrades.